Whether you are buying your babies very first crib or transitioning from a bassinet, selecting a safe crib and place for your little one to sleep is of paramount importance for every parent. 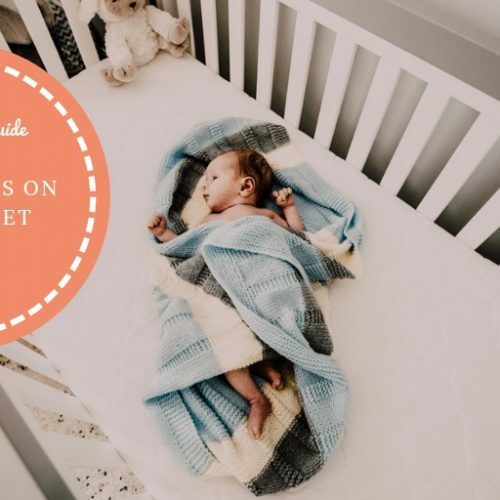 Bassinets and other co-sleepers that some parents can typically only be used for the first 6 months, whereas cribs can be used from day one, allowing you to make your budget go further. Also, unlike co-sleepers, cribs sold in the United States are regulated by the Federal Government, and some also have additional certification from the Juvenile Products Manufacturers Association (JPMA). Currently, there are many baby cribs available, which vary in type, design, and style. In this guide, we will take a look at some of the best baby cribs available, while taking into consideration their safety, portability, cost, features and more. Graco is a well established and trusted brand in the child products market and based on reviews online this convertible crib has a superb reputation among parents. The classic style and solid wood design is available in ESpresso or white and has traditional appeal but with all the modern perks you would expect of a modern crib. Not only does it meet Federal safety standards, but it also holds JPMA certification and American Society for Testing and Materials (ASTM) certification. Since it’s convertible, the Graco can be converted into a regular toddler bed when your child is ready and it includes everything required to achieve this. Unfortunately, it does not include a crib mattress, but this is pretty standard of most brands. On the upside, you can use a standard size crib mattress. This crib does require assembly, but it’s a relatively straightforward process and the instructions provided are very clear and easy to understand. The crib does not include any storage or drawers, but there is adequate space underneath the crib to add your own DIY storage. This modern style convertible crib features rounded spindles and a solid build that will look good in a wide variety of nursery decors. The Babyletto is also has a reputation of being easy to assemble and includes the toddler bed conversion kit. Assembly of this crib is relatively straight forward and would probably take the average person between 30 to 60 minutes. It is a 3-in-1 meaning you can convert from a crib, to a toddler bed and then into a full size bed. It does include the crib to bed conversion kit, which is certainly not too common. It also includes a toddler rail, which many brands have started to not include with their regular price. It does not include the toddler bed to full size bed conversion kit, but you can purchase this separately when required. However, many parents do actually end up choosing a regular bed at this point, so you, in reality, you may never need it. The toddler bed has a total weight limit of 50 pounds, so it should get a good few years to use out of it before your infant needs a regular sized bed. In terms of safety, this crib does meet Federal Safety Standards and meets ASTM international Safety Standards. The bed frame is made from sustainably sourced New Zealand pine and is free of lead, phthalates (e.g BPA), and over 360 other volatile organic compounds (VOCs) and thousands of other chemicals. It’s also available in a variety of attractive finishes including grey (pictured), white, slate, espresso, and natural pine. It does not come with a mattress included, but you the same brand does offer a crib mattress that fits the crib well. Overall, this is a great crib, although the price tag is a little higher than some of the other cribs in our list. The DaVinci is another popular convertible crib that has been popular for a number of years. It boasts a high quality wooden design with a very appealing classical style reminiscent of something you might find in a Victorian or old style nursery. It’s also available in multiple colors including Cherry, Espresso, Black/Ebony, White, and Chestnut. This is a 4-in-1 convertible crib, meaning that you can transform it into a toddler bed, daybed and full size bed. The process is relatively simple, you purchase the conversion kit when your baby reaches the necessary height limit. For example, when your baby reaches the crib height limit of 33 inches or begins climbing you can convert it to the toddler bed. This crib does not include a mattress, which is quite normal, but it will accept many different standard size mattresses. The cribs mattress platform can be adjusted to four different heights, which is ideal as your infant continues to grow as you likely need to lower it over time. In terms of safety, the DaVinci crib meets the Federal Safety Standards, as well as American Society for Testing and Materials (ASTM) certification. The crib also made from 100% sustainable New Zealand pine wood, which will certainly sit well with those who environmentally friendly. The paint used is also lead and phthalate safe which is certainly reassuring. Overall, this is a brilliant crib for the price range, but like everything, it does suffer from some disadvantages. This includes the fact that some of the hardware e.g. the screws do contrast a little too much against the wood finish than some may like. In addition, they recently stopped including the toddler rail, which certainly was an advantage. A great option for parents on a budget and for those looking for something that will grow with their child is the Dream On Me convertible crib. It also offers a very solid and sturdy build and is available in a variety of different finishes including white, cherry, natural, black, and espresso. As you might have guessed, it’s a 3-in-1 convertible crib, so it can be easily converted from baby crib to toddler bed and then to a full sized bed. In order to achieve this, you do need to purchase a conversion kit, which is sold separately. In terms of safety features, the Dream On Me meets Federal Safety and ASTM standards. It’s also made from a high-quality solid pine wood and stain that is free of BPA (phthalates), lead, and latex. The mattress height can be adjusted to three separate positions, ideal as your baby begins to grow taller and move around more. Ultimately, this is a pretty standard looking baby crib, but for the price, it certainly offers good value for money. If you are looking for a baby crib that offers maximum safety and portability, then the BabyBjorn is a top quality travel crib that is lightweight, secure and can be assembled in a matter of minutes. The crib weights just 13 pounds and is made from a breathable, mesh polyester material and an aluminum frame. As well as ensuring maximum breathability, the mesh sides also make it easy to supervise your child close up or from a distance. Both the crib fabric and mattress can also be removed and cleaned in the washing machine, making it easy and convenient to maintain hygiene standards. This travel crib includes a mattress, which comes with a base plate, helping to provide the crib with some stability and to ensure it stays in a firm position throughout sleep. It also meets the Federal Safety Standards and is Juvenile Products Manufacturers Association (JPMA) certified. One of the best features of this travel crib is the fact that it can be assembled almost immediately. all the legs unfold automatically and there are no loose parts to attach. When not in use you can easily fold it up and store it in the compact carry case, which is ideal for travel and storage. When choosing a new crib, there is little doubt that safety is the number one priority. But what exactly makes a safe crib and what things should you look for to make sure the crib you choose is safe? It may be tempting to save money by buying a second-hand crib or to use a hand me down. Equally, you may like the look of an antique crib that is potentially many decades old. The main concern is that old cribs are unlikely to abide by the latest Federal Safety Standards. For example, some old style drop-side cribs were banned due to a series of incidents involving injuries and fatalities. For this reason, it is essential that you always buy a new crib or one that satisfies the latest safety standards. The latest which can be found on the official Consumer Product Safety Commission’s (CPC) website. Although all cribs are legally obliged to meet federal safety standards, some parents also like the peace of mind that comes with additional JPMA certification. Cribs that have been certified by the JPMA have been tested at an independent laboratory to confirm it meets the highest standards for quality, safety, performance, and functionality. Therefore, it’s certainly worth considering for parents who prioritize safety and want additional reassurance. When you are looking to buy a new crib, it’s important to consider the features. There are many different features marketed, some have very little practical benefit, while others do actually provide some advantage. Ultimately, you will be the judge, but here are some features that parents often prefer. At first, the height of the crib mattress is of little importance, since your baby’s ability to move independently is very limited. However, as your baby continues to grow and develop, they will eventually be able to sit up, stand and climb. At this stage, the ability to adjust the crib mattress to a lower height is often essential. As a result, you need to look for a baby crib with a mattress height that can be adjusted. For some cribs, this a relatively straight forward process, yet for other’s, it may require the use of tools, so it’s certainly worth taking some time to check the manufacturer’s instructions. Another useful feature are baby cribs with a single side drop down gate. This allows you to easily access your baby when you need to reach into the crib and lift them out. It also means you can have the crib mattress at the lowest height and not have to worry about straining yourself. Baby cribs that have castor wheels are one feature that many parents look for since they like the idea of being able to easily move the crib around and from room to room. This is considered especially important for parents who may begin with the crib in their room but intend on moving it to to the nursey in the near future. The major issue with this reasoning is that that majority of cribs are much too large to easily fit through the average residential doorway. Therefore you will most likely have to take the crib down and reassemble it anyway. Yet, wheels may still be considered important for some, so just ensure they can be locked when not in use. Baby Cribs Vs. Bassinets: Which To Choose? As you may be aware, bassinets are very popular among new mothers, often due to their small size and portability. Yet it’s important to remember that they are generally only suitable for babies under the age of 4 months old. After this time, you will need to transition from a bassinet to a crib. In addition, many bassinets and co-sleepers do have to adhere to federal safety standards. So it ultimately becomes a question of safety and cost combined, with many parents seeing little sense in ever using a bassinet at all. Check out this article if you want a more in-depth comparison between cribs and bassinets. While there are many different types of cribs in terms of style, shape, and material, cribs can be organized into a few general categories. These may suit parents with very different circumstances, so being aware of the different types of cribs is certainly helpful. Standard is a very general term and in the context of baby cribs, it generally refers to cribs in the lower price range. Standard cribs often lack many of the features of higher range models, but they often meet the needs of many parents that are looking for simplicity. In general, standard cribs have four side walls with rails and are made from solid yet cheaper materials. Perhaps there biggest downfall is that they lack the portability many parents may be looking for. As the name suggests, convertible baby cribs are cribs that are able to be converted from a crib into a toddler bed. These are designed to be changed as your child continues to grow and develop. For example, they will begin in the form of a standard baby crib, but can later be converted into a bed when your child is ready. Many parents find convertible cribs help them save money and since the alterations are often minimal some parents find that their child has an easier time adjusting. However, it’s important to bear in mind that many convertible cribs do require you to purchase separate parts. Often these are sold as a “conversion kit”. Travel cribs are designed with the intention for vacations, camping, and long distance travel. They are often made from lightweight materials such as fabrics and mesh and can be folded into very compact configurations. Often they can be fit into a relatively small carry bag that is ideal for storing in the trunk of the car or taking on vacation and on planes. They often also have a very quick set up time, sometimes taking as little as one minute to take out and set up. The major disadvantage of travel cribs is that they are not as durable as standard cribs. This is due to the materials they are made from, so with long term use, they will probably not last very long. Still, they are ideal for travel. Similar to travel cribs but different in many ways, portable cribs are ideal if you want a crib that easy to fold up and store away. These space saving cribs are often made from the same materials as regular cribs but are designed so that they are easy to move around and store. Common portable crib features include castor wheels, that make them easy to move around the house, as well as a folding design. This allows you to fold the crib into a compact configuration, ideal for storage when not in use. Often the folding feature is particularly useful for those with limited storage space. Another useful feature that is relatively uncommon is a portable crib with dimensions small enough to fit through the average doorway. Therefore, if this is your desire, make sure to check the cribs dimensions and your doorway before making a purchase. It’s also worth noting that you will still need a place to store the mattress as well as the frame. If you are a parent who prioritizes the safety of your child, you’re not alone. And when it comes to buying a new crib it’s easier than you think to secure a safe, durable and high quality crib. Remember to always buy new and check that it meets all the essential Federal Safety Standards. For additional peace of mind, you can also opt for one with ASTM certification. What type of crib do you prefer? Do you think we have missed anything important? Let us know and share this with anyone looking for the safest cribs on the market.